A few months ago everyone in our family had colds. As a consequence we were buying bag after bag of oranges for juicing. It was an attempt to nurse ourselves back to good health. Today we are all fighting fit but there was a remnant bag of oranges in the fridge which no one seems to want. Even when there is “nothing to eat” I can’t seem to tempt anyone one with a two month old orange… funny that. Given that nothing in our house gets thrown away, and I needed my fridge space back, I knew it would be up to me to transform these unloved oranges into something a little more appealing. My first thought was marmalade but I didn’t think I would be able to get the “little ones” to eat that in the necessary quantities. I decided I would try a sweet orange jam. Then I remember the Grand Marnier Jam I made years ago, and it was settled, that was what I would make, even if I was eating it all myself. I had an assistant helping today, Jessica (eldest sons girlfriend) would do the cooking leaving me free to do the photos. I love school holidays, everyone gets a job!! A couple of these jars are earmarked as gifts as part of the “CSR Bake A Difference” Fundraiser. 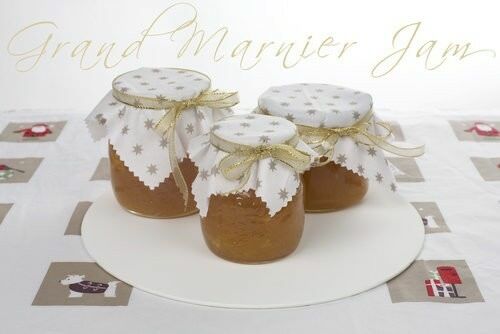 (I have posted the details of the fundraiser previously) So far I have made Raspberry Jam, Shortbread Christmas Tree, Coconut Ice and now my slightly boozy, Grand Marnier Jam as gifts. The promotion is being co-coordinated by the lovely Jeroxie who will be compiling all the recipes on her site also. Preheat oven to 50 degrees. Place a saucer in the freezer for later use. Place your preserving jars in a saucepan full of water and bring it to the boil. Allow to boil for five minutes. Remove the jars with tongs and place in the oven to dry. Turn the oven off. Remove the skin and seeds from the oranges and cut into chunks. 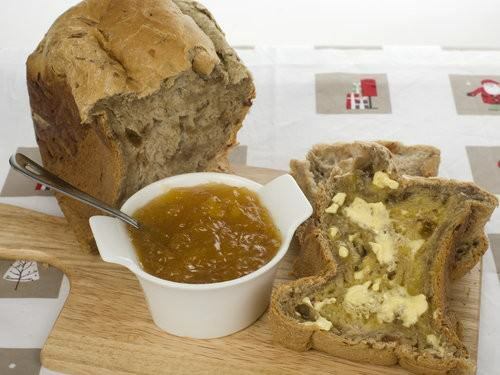 Whilst the jam is still on the heat use a stick blend to further liquidize the orange. 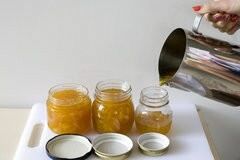 Continue to boil the jam for five minutes.Place the oranges, cinnamon, star anise and 2 cups of sugar in a large heavy based saucepan and cook over a medium heat until the fruit becomes soft and the mix is liquid. In a separate container use ¼ cup of sugar to mix with the sachet of Jamsetta. Reserve this for later use. Add the remaining 1 ¾ cups of sugar to the orange jam. Continue to stir and bring to the boil for a further five minutes. Whilst the jam is still cooking remove the cinnamon stick and star anise. Add the Grand Marnier and grated lemon rind and boil for a further five minutes. Add the sugar and Jamsetta mixture and continue to stir and boil for five minutes. Using the plate which was chilling in the freezer, drop a small teaspoon of jam on the saucer. Return the saucer to the freezer for 1 minute. Test to see if the jam wrinkles to touch. Once this occurs the jam is ready to put into the sterilized jars. If it is not ready boil for another 3-5 minutes and then retest. 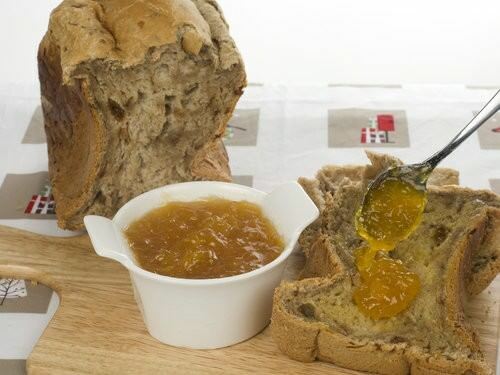 I am very happy with the taste of my jam, it is lovely and fruity with a good splash of Grand Marnier. It would be fantastic heated and used as a sauce over a dessert, cake, cheesecake or ice-cream. It almost tastes too nice to be used on plain store bought toast. Hence below, I baked a loaf of spicy fruit loaf. While it was fresh from the oven it was lavishly applied with butter and the Grand Marnier Jam. Delicious!